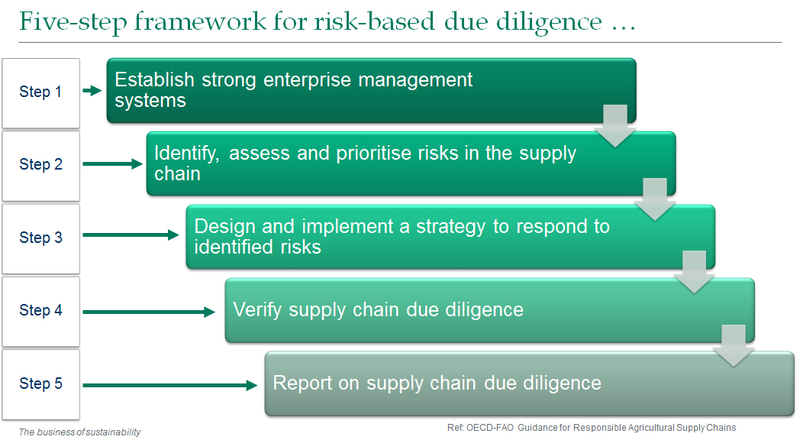 Supply chain management is key and an essential strategy in facilitating sustainable business success. An effective supply chain is composed of producers, distributors, and consumers—interlinked to meet consumer demands, improve quality of life and the environment, and guided by good corporate governance and a responsibility to all parties. By the same token, each link within the supply chain will need to continuously identify and withstand change, challenges, and future risks. CP ALL Plc. and its Subsidiaries (“the Company”) have recognized the importance of operating a fair business, particularly with our business partners who will benefit from development opportunities and capacity building in order to grow together in the long-term. While the production and delivery of products and services whose quality and variety meet consumer demands are important business goals, the Company also believes that sustainability principles and issues constitute significant agenda and goals that ensure the strength of its supply chain. The Company is proud of this commitment, which reaffirms our organizational philosophy: “Through happy employees, we desire to see smiles from customers”. In 2017, the Company established policies and performance targets for our trading partners in order to support and build trust in sustainably growing together. Based on sustainable development policy and goals, the Company has drafted a sustainable sourcing policy and supplier code of conduct and guideline. A Product Selection Committee has also been established to oversee product assessment and selection prior to being sold in 7-Eleven store, while preventing any possible conflicts of interests in sourcing and ensuring the accurate, transparent, and traceable use of specific information related to the procurement and vendor selection process. Following such policies, the Company developed a communication plan to its first-tier suppliers to ensure understanding, with the expectation that in addition to implementation, they will in turn cascade these policies to their trading partners and subcontractors. It is the Company’s determination to create awareness, collective responsibility, and elevate these standards throughout the supply chain. Additionally, the Company has also created plans to support suppliers’ preparation to meet these expectations and extenuate any potential risks that may incur to suppliers throughout the supply chain—as is outlined in our policy. In line with this, the Company has conducted trainings that include sustainable development guidelines as an important part of supply chain management. 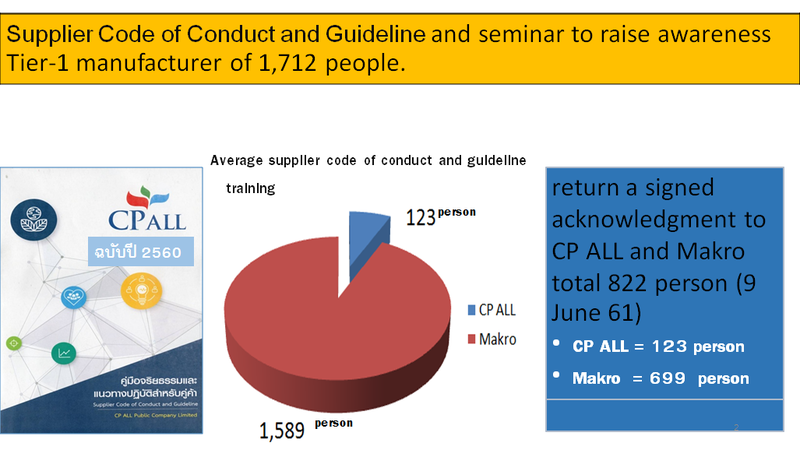 These trainings were offered with the cooperation among the Company’s various departments, such as each business procurement department, marketing management department, and product development and quality assurance department, across a range of processes from procurement, vendor selection, responsible supply chain management, to supplier relationship management, as seen in the diagram. In the same year, the Company’s subsidiaries have made headway in initiating ethical and sustainable and practices. Dynamic Management Co., Ltd., for instance, has distributed handbooks on good practices related to the delivery of temperature-control products, established monitoring measures for delivery vehicles that account for safety, occupational health and pollution emission, as well as screening for the use of child labor in the transportation sector. Siam Makro Plc. and CPRAM Co., Ltd. have adapted these practices to their specific business contexts, and have started communicating these policies and expectations to their suppliers. 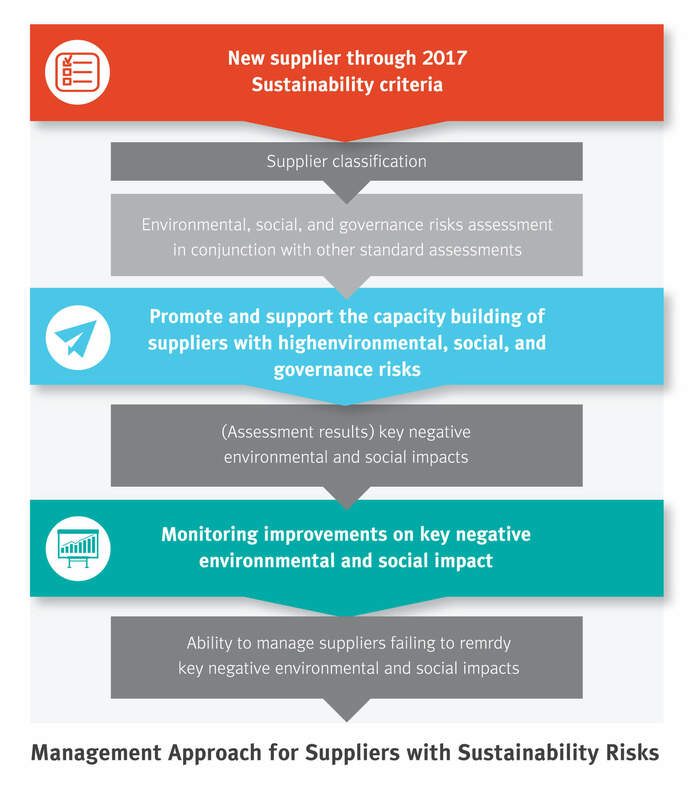 In 2017,the Company started to incorporate sustainability issues, including environmental, social and governance, in assessing current suppliers as well as in the selection of new ones. Furthermore, the Company has also classified suppliers based on type and importance to determine the level of support and needed awareness. Suppliers are categorized as strategic suppliers, suppliers in special collaboration with the Company, and other suppliers, such as those vulnerable to business and sustainability risks. In addition, the Company has a policy to promote and prioritize the use of locally sourced raw materials in the country in which it is located, to promote the country’s economy and to reduce energy consumption and greenhouse gas emissions caused by transportation. The Company currently has a proportion of the cost of raw materials and packaging to domestic and foreign partners. Through efforts on sustainability and capacity building with suppliers, the Company is able maintain good relationships with its suppliers. For instance, construction sub-contractors, one of the key supplier groups, reported a continuous growth in satisfaction and engagement. * In 2017, The company has adjusted survey method of the satisfaction and engagement to intensity and cover issues of sustainability. Critical tier 1 suppliers comprise with trade and non-trade groups. Critical tier 1 suppliers are classified by high spending suppliers, representing over 80% of total annual transaction and suppliers who provide strategic components/products or services. Performance Highlights The Company works with its suppliers across various projects in order to achieve its sustainable development policy objectives and targets. These encompass assessing raw materials sources to ensure the absence of deforestation and damage to marine resources and supporting the protection and rehabilitation of natural habitats. These projects include: Blue Crab Breeding Project for Natural Water or the “Crab Bank Project” Presently, the rising demands of crab meat is outpacing the natural repopulation rate, which is currently below replacement level. 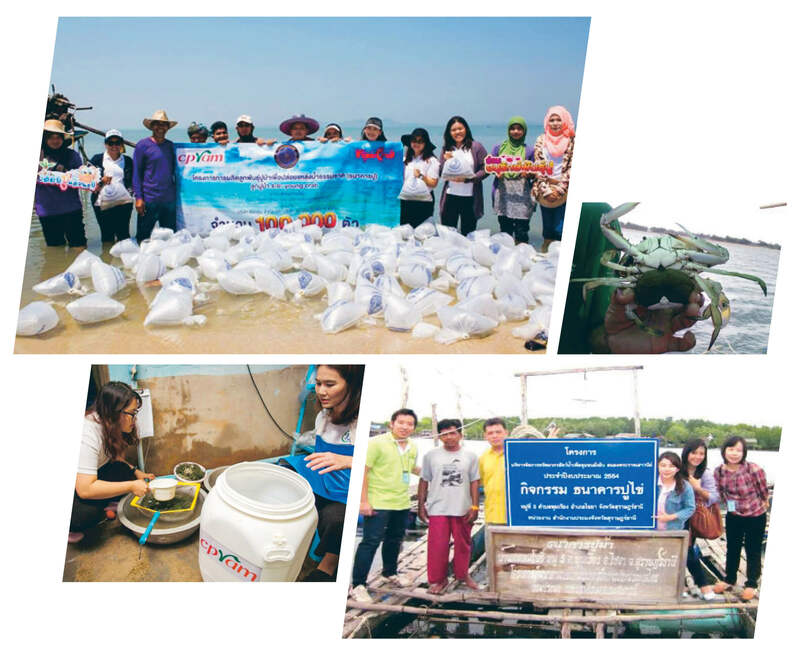 In response, the Company initiated a blue crab conservation effort, establishing targets protecting resources both in the Gulf of Thailand and the Andaman Sea. The project helps the Company address challenges connected to a low supply of crab, as well as helping preserve natural resources and to help support small holders (local fishermen) sustain their livelihoods. Crab is an important raw material for CPRAM Co., Ltd.’s production plant, and is also an ingredient for 7 ready-to-eat menu items at 7-Eleven store, amounting to total sales volume of 575 million Baht in 2017. The project helps restore 48,384,000 baby crabs/year (crab meat consumption is, on average, at 8,024,390 baby crabs/year). “Crab Bank Project” is a project aimed at the conservation and propagation of crabs in the area, by hatching crab eggs from the female crabs, whose eggs are attached outside the shell. This promotes conservation fishing practices, raising awareness on the ethical and responsible fishing of blue crabs and use of national resources. The parent stock with eggs attached are given to suppliers to be placed in temporary resting cages in the ocean, until the eggs hatched. Nurseries are then hosted in the cage. The younglings would be then released into the ocean, so they may grow naturally. The result is a successful conservation of blue crabs, enabling natural repopulation, which allows small holders to sustainably maintain crab fisheries. and supply raw materials to processing plants.